This allergen free peanut butter flavored bone will satisfy your dogs natural urge to chew and keep them occupied. It's designed to be long lasting which is perfect for powerful chewers. Bristles help to clean teeth, freshen breath, and promote oral health with every gnaw or chewing action. Helps to encourage safe, healthy chewing habits so you can save your shoes and furniture from destructive chewing. Nylon & Allergen-Free Artificial Peanut Butter Flavor. It's important to select the proper size and type of chew for your dog's age, weight and chewing strength. Non-edible chews should be large enough to encourage chewing from the side rather than top and bottom. If you have more than one dog in your household, select chews appropriate for the largest, strongest chewer. Always supervise the use of all chews and toys. Inspect before giving to your dog to make sure it's whole and intact. Check frequently and replace if worn or damaged. Can I put my dog's Nylabone® in the dishwasher? Nylabone® Chews and Toys should not be autoclaved, boiled, placed in a dishwasher, washing machine, convection or microwave oven. To clean Nylabone® Non-Edible Chews, scrub with a brush under warm water, using mild, non-toxic detergent, and rinse thoroughly. Inspect for wear while cleaning. When should I replace my dog's favorite Non-Edible Nylabone® chew? Replace when knuckle ends are worn down, or if it becomes too small for your dog to chew safely. 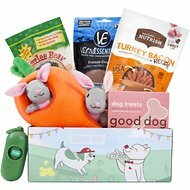 Where are Nylabone products made? Most Nylabone® Products are made in the USA in our facility here in Neptune City, NJ. 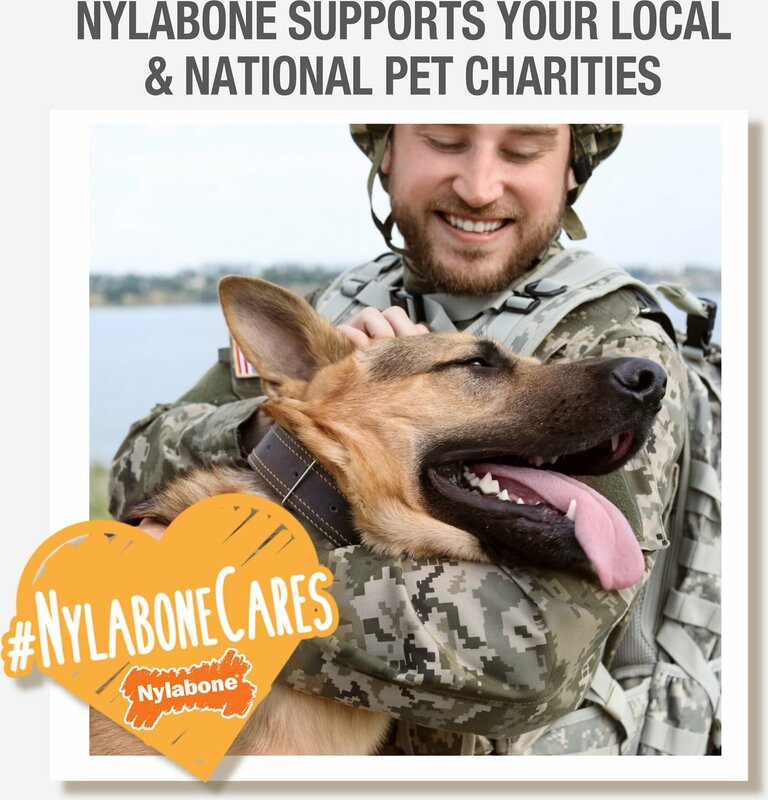 All USA-Made Nylabone products have the American Flag on the package.A few of our products are made in China. 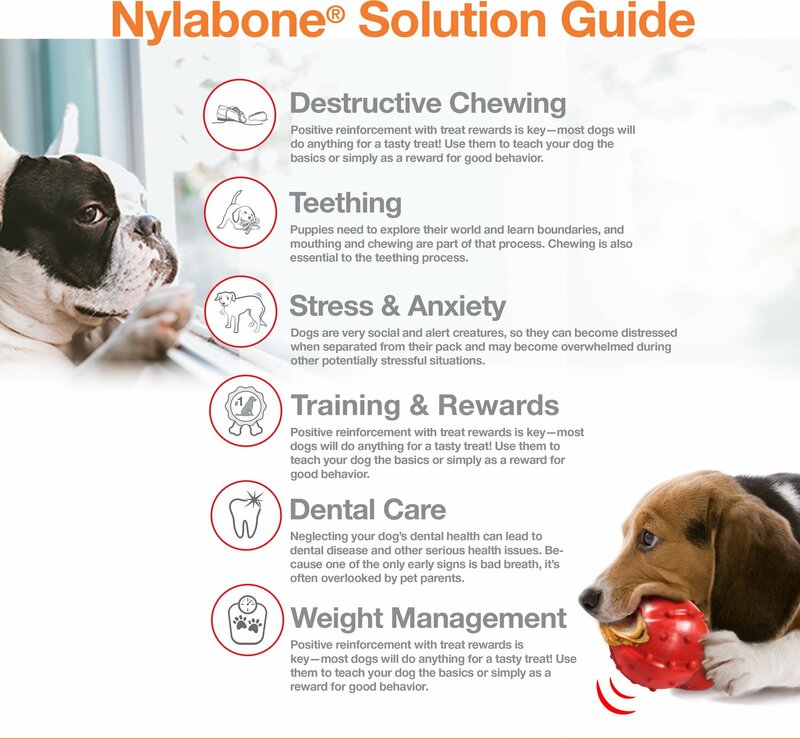 Be assured that all Nylabone manufacturing partners - both domestic and overseas - must adhere to stringent quality control standards for every product that bears the company’s name. Our quality control team visits these plants on a regular basis to ensure policies and procedures are in full compliance with our rigorous regulations.We have a regular ongoing testing program in place to further ensure the quality and safety of our products. For added assurance, we use independent, third-party testing facilities. The confidence of the consumers who use our products is of paramount importance to us. Wonderful for my Super Chewer! No joke, my dog has destroyed Kong toys in a matter of minutes. She loves to chew on her toys, but it’s cost my a fortune to keep up with her. This toy has really impressed me so far, especially with the price! We got it today, and it’s still fully intact. She’s barely put a dent in it, and it’s kept her busy for a few hours. She likes to play fetch with it as well, and it has a nice bounce on the floors in my house! Will definitely buy more when she eventually chews it down to the core! She sniffed it and moved on. My 5 month old Golden Retriever / Great Pyrenees mix loves her toys, and especially her food flavored ones. I thought this would be a hit for sure. I excitedly opened it and handed it to her, she sniffed it and walked away. Now we're left with toys she never touches. A waste of money for us. I went by the weight to buy the right size for my dog, and ended up with the monster size. I'll admit that when I received the item, I thought it was going to be too big. Turns out it isnt and my dog loves it. Very durable. Love the durachew items for the extreme chewers, some dont hold up well, but this one sure does! 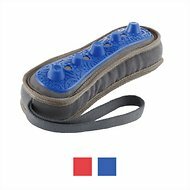 The ends of these are fairly large for my dog's mouth (30lb labradoodle puppy) which is great because it is MUCH more difficult for her to wear away at this than her other Nylabone. She seems to really like the textured ends. Doesn't smell like anything (to me). She does seem to prefer her meat flavored Nylabone, but she doesn't dislike this one either. I have a big pittbull who goes quickly through balls and bones, some of them lasting few minutes. This nylabone is great, virtually indestructible. It is his favorite now. Great for maintaining clean teeth as well. Recommended. Bought this for my growing puppy (8months) as he seems to go through the puppy chews quickly. He is using it some of the time but seems to still prefer the regular puppy chew. Giving it 5 stars for durability. I purchased two of these for my dogs and I ended up bringing in one to work for the office dogs to share. Turns out, every dog that has encountered it has loved it so I highly recommend for a good way to keep your dog busy and from chewing on things they aren't supposed to be! I have two 80lb pits that are very heavy chewers. Nothing ever lasts long. They absolutely love all nylabones and they last super long. They are a little pricey but considering how long they last it really is worth it. I have a pit mix that is a power chewer. It’s not his favorite but when he would chew this, the plastic would peel back and cut his gums. So I had to get rid of it within the first time he actually used it. I feel like it was such a waste because he really liked the rounded area quite a bit. At first I thought this mega bone was too much for my 75 lb, german shepherd but she began to carry it around and loves chewing on it but after about 3 weeks it still looks close to new. She enjoys it but has not begin to wear it down. Thank you nylabone.